For maximum effect, read this review three or four times. Sure, he does now, but that wasn't always the case. Originally introduced in an issue of Fantastic Four, Multiple Man was an absolutely nothing character until Peter David took a shine to him while writing X-Factor. He pushed Jamie's powers in new ways, and gave him an actual personality, pulling the character off the D-list and up to the... well, not the A-list, certainly, but definitely at least C+ or B-. Nearly everything about Madrox other than the "there used to be only one of me, but now there are two!!" gimmick came from the pen of Peter David. 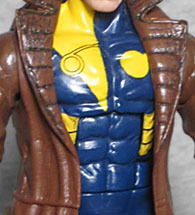 This figure shows Multiple Man in his '90s X-Factor costume - his original suit was designed by his farmer parents, and allowed him to control his powers (though they never told him that, and then they were killed by a tornado). Though X-Factor's team look was optional, Jamie opted to go with the same blue and yellow as everyone else - though he often wore a trenchcoat over it. The coat is that one mold they have, but the arms are new. Why? Uh, dunno. Beneath it, we get a plain body in dark navy blue with some random yellow elements painted on. Even before he was interesting, Jamie's powers were to make copies of himself - in fact, creator Len Wein originally wanted to called him "Zerox," rather than "Madrox," but Roy Thomas (who was editor-in-chief at the time) was smart enough to head that one off before the inevitable lawsuit. A decade ago we spitballed ideas of how he could work as a toy, but Hasbro kept things simple: alternate heads. Multiple Man's costume had a tight cowl with an X in a cirle on the forehead, and two of the heads do indeed get that - the one he's wearing in the tray has an unhappy frown, while the first alternate has a little bit of a smirk (probably trying to keep from laughing while he plays a prank on somebody). His third head is uncowled, revealing his hair - it's not quite the Billy Campbell 'do he had in the '90s, but rather a more modern look that dares ask the question, "what if John Mulaney and John Cena had a baby?" Getting three heads is nice, because it will allow army-builders like our own Rustin Parr to buy multiple figures and have them all look unique in the display - as long as you don't mind having a bunch of spare BAF pieces hanging around. 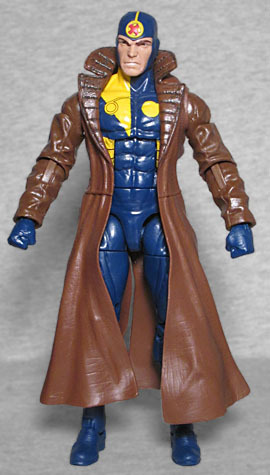 The Build-A-Figure for this series is Apocalypse, and Multiple Man comes with the big guy's right leg. It's just a shame Apoc doesn't have any wepaon or anything he uses multiples of, so that could have been included here and not left overeager double-dippers with parts they can't use. 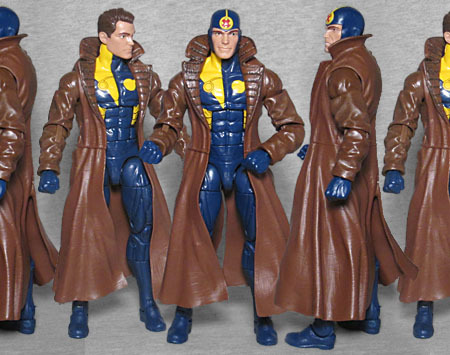 Three heads are better than one, but imagine if Hasbro had gone HAM on the idea, including a new Madrox head with every figure in this series, each with a different expression or haircut. That would have been unbelievable! As it is, we're going to need more X-Factor uniforms now.